Worldwide smartphone shipments stormed back last quarter with 37.2 percent in growth, and Apple's iPhone led the way with a 97.9 percent year-over-year surge in shipments. 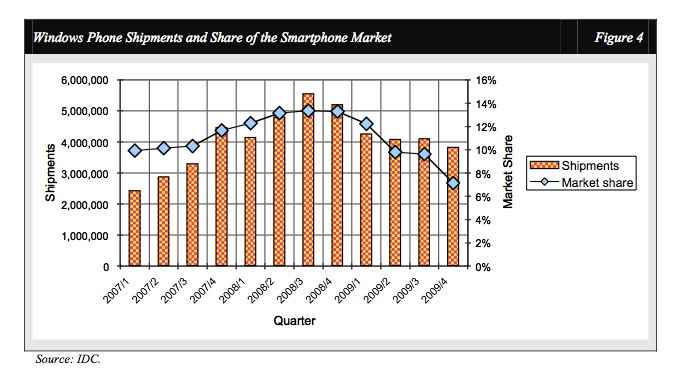 But the real coming battle in the mobile market, according to one analyst, lies between Microsoft and Google. Analyst Charlie Wolf with Needham & Company provided a breakdown of the expanding smartphone market, which in the holiday quarter rebounded from just 5.6 percent growth over the previous four quarters. While Apple saw the greatest success, Nokia's shipments also jumped 37.3 percent and Research in Motion saw a spike of 41.2 percent. While the recession has softened and the smartphone market is recovering, Wolf is now looking to the future and the fiercely competitive handset business. "Events since the beginning of 2010 have turned the market into a land grab not dissimilar to the California gold rush in the 1800s," Wolf wrote. 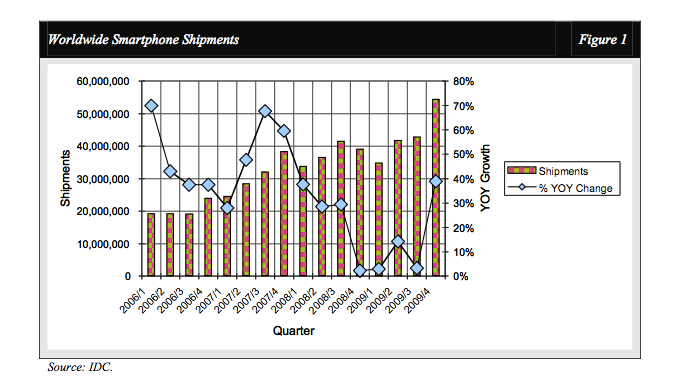 "Everyone is chasing the iPhone which has taken on an aura that far exceeds the phone's market share. The aura stems from the disruptive design and functionality of the first iPhone, and it has been reinforced by the remarkable success of the iPhone App Store." The analyst said he believes the smartphone market has turned into a "land grab" that is "virtually certain" to lead to a brutal battle between Microsoft and Google. He said Microsoft's Windows Phone 7 Series won't kill the iPhone, which exists in a class by itself, but it will be a potential "Android killer." Windows Phone 7 Series, Wolf said, is evidence that Microsoft "finally gets it." "Microsoft has delivered on the necessary condition for success —a smartphone operating system that should enable it to play in the same sandbox with Apple, Google and BlackBerry," he wrote. "We've frequently criticized Microsoft's inept efforts in delivering a user-friendly smartphone operating system. Such criticisms are now in the past." The real coming smartphone battle, he said, lies between Google's Android mobile operating system and Windows Phone 7. Android has a few advantages, in that it licensees do not have to pay any fees, and it allows manufacturers to differentiate their phones from other Android devices with custom interfaces. But Android also has no presence on the enterprise market, where Microsoft and its entrenched position with Windows will play to the Redmond, Wash., company's advantage. "A major battle between Microsoft and Google to win the hearts and minds of the smartphone vendors who are building devices for both platforms appears inevitable." Microsoft is also expected to extend its new Windows Phone 7 mobile operating system to non-phone devices such as the rumored Zune HD2 portable media player. The first phones running Windows Phone 7 Series are expected to arrive by this holiday. Wolf also spoke of the success BlackBerry has found "out of the limelight," and the struggles faced by Palm despite the company's "superior platform." "We have little confidence in a material acceleration in Pre sales because Palm simply does not have the financial resources to market its devices at a level comparable to its competitors," he wrote. "But miracles do occur occasionally."